We are in a constant state of motion. Whether we learn and evolve is entirely up to us. Music translates so much of what humankind is in the middle of doing. It is the observation point on the deck of life. We chose to either deal with what comes our way and create it into something positive or succumb to it and let it drive us mad. So much to learn, so much to observe, so much more music to open the doors of our minds and spill our guts onto the floor. Andy Gill is just one of the few who might understand the power of observation to music and then again dancing to a punk funk might be the bloody cup of tea we all need to homogenize our fretful souls back into the notes and flavors of our own delightfully playful musical gardens. Song River: The Gang of Four punk style has been given a few labels over the years: post-punk, dance-punk, etc... to you what is it or does it even matter? Andy Gill: I think people get the wrong idea if they think it's punk rock. I don't think that GO4 has much to do with punk itself. I'm perfectly happy with post-punk or punk funk, I really don't particularly mind. Song River: We live in a world that seems to be afraid. Afraid of everything. At one time 'Afraid of Americans' seemed to be the front row seat of fear. Looking at the political global picture what in your mind has happened to society? Andy Gill: The old consensual politics where reason seemed to play some kind of role is on the verge of a complete breakdown. The re-election of Jeremy Corbyn as Labour leader in Britain means there is absolutely no opposition to the Conservative machine and labor is unlikely to ever be elected again. People feel they are giving it to the establishment, in fact, they are giving in to the establishment. Same thing in the USA with Trump and Clinton, it appears people support Trump on the basis that he appears anti-establishment. As we move on into history people will look back on the 'naughties' and the 90's as some kind of golden age. Song River: Can music still be a catalyst for information or is anyone listening anymore? Andy Gill: I think the band has never been that much about conventional politics it's always been an observer of behavior and ideologies. But having said that, politics is always shadowing the content of the GO4 songs. I think a lot of us thought in the 60's that there would be ongoing steady progress in all areas of life. Society would become more liberal and progressive - prejudices would slowly disappear as we understood each other better. Women would be treated equally to men and be paid the same, racism would disappear. We now know that history is not a process by which the world inevitably gets better and better and we were wrong to imagine that that would be the way it would go. It does seem like new bands are less inclined to be involved with anything to do with politics. I think people are possibly afraid they might end up boring the audience. I sometimes think these things are rather a fashion lead, and politics is not in fashion. It's a less straightforwardly polarized world now than it was in the late 70's early 80's. I really like sleater- Kinney; obviously not a brand-new band, but still comparatively young and their music and approach are imbued with all kinds of political themes and sexual politics. Bands, in general, should be a bit more interested in making things that are important and radically new. Song River: Curious. Do you miss the days of Thatcher and that period of time to write music about? What was different do you think during those earlier days by comparison to our current climate to write about? Andy Gill: People often forget that all the songs for the band's first album, Entertainment! were written before Thatcher became prime minister. At that time Britain was in the throes of recession and we lived in Leeds in the north of England which was very rundown. Certainly, Gang of Four reflected the mood at the time. Britain was a very polarized place - almost on the point of civil war. Obviously, there are big differences between that time than in the 80's and where we are now but still the primary system is Neoliberalism/Capitalism. Our world is just as interesting now to write about as it was then. I think sometimes people look back on those previous years with some kind of nostalgia, probably simply because it was a long time ago. Song River: What is it as you proceed with Gang of Four, that you yourself would like to see happen with the music (in general as well as Gang of Fours) and how it is being digested by the industry? People are screaming for their own control and independence- yet we seem to rely still heavily on social media opinions. How do you gauge yourself and the band in this climate (Industry acceptance/radio play/streaming/fans)? Andy Gill: Well I will answer these questions together. In the past, it used to be that paper magazines such as, in Britain,the NME that were really important, the places you went to to get new information and hear what people were saying about music and ideas. Social media and music websites have kind of taken on that role. So musicians, including us, know that we have to use various social media channels, especially Facebook, in order for people to know what's going on. And in my experience working with major labels usually gives you more creative freedom than working with independent labels. As you know, I've produced many, many records so I have had extensive experience with those majors and Indis. YouTube pays basically nothing to artists, and Streamers pay next to nothing so the outlook is not rosy. David Lowery from Camper Van Beethoven took on streaming service Spotify. He has begun a potential class-action copyright-infringement lawsuit against the company through the lawyers Michelman & Robinson. I plan to get in touch with him ; he’s doing the right thing. Song River: It has been said that the Gang of Four has been one of the most influential bands over many bands in the industry (Red Hot Chili Peppers/Nirvana). Do you feel like what you all were and are presently doing was/is set up deliberately to have others follow or are you just doing your thing and whatever everyone else is doing is their thing? Andy Gill: I’m just doing my thing. I don't spend a lot of time thinking about who I have influenced or not, but yes I suppose it's flattering that you get name checked. I'm grateful for the good things that other artists that I respect enormously say about me and the band, it's kind of them. Over the last year, I've been really interested in what St. Vincent (Anne Erin "Annie" Clark) is getting up to and so I was completely surprised, and delighted when she named me as her favorite guitarist. Song River: Would you agree that Gang of Four has become a music history icon? Andy Gill: Yes, I guess so. Song River: The album, Live... In The Moment and DVD create a feel that takes you right back to the late 70's and the dark smoke-filled clubs of sweat. It sounded like you had said Andy at the opening of "Love Like Anthrax" something like, 'specially for you we are now going to do one of the most commercial records ever made...' if that was heard correctly- is it and how so? 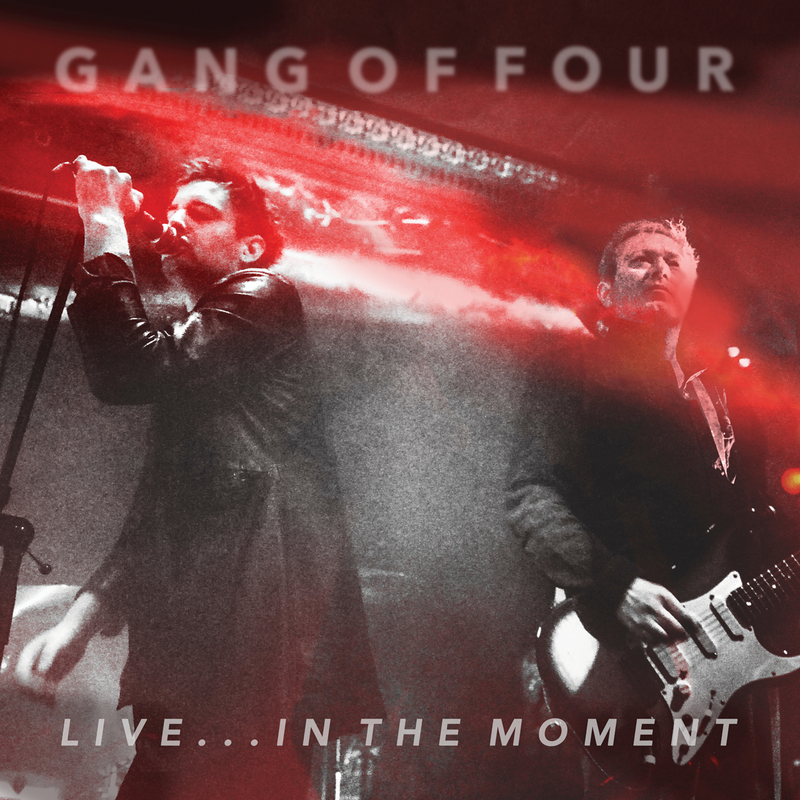 Song River: Gang of Four's Live...In The Moment really contains multiple parts of the band's persona. 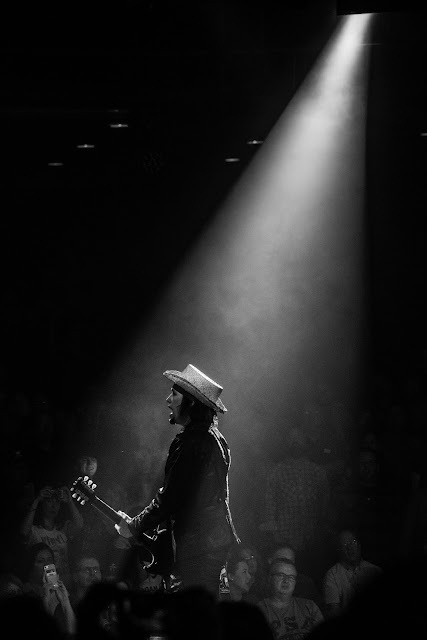 Any particular track off the record that all of you personally like performing live? Andy Gill: I think we all love playing all of it. But maybe the newer songs are a little more fun. Song River: After listening to the whole record- between your guitar work Gill, the bass of McNiece, Finnegan's drums and Sterry's vocals it seems once again Gang of Four is on the cutting edge and other punk/funk bands will be paying attention. Each member of the band seem to stand out as well individually- your guitar work Gill is beyond master- the funk line of McNiece is the groove- Finnegans drumming is the outer capsule of motion- and damn if Sterry's vocals don't grab you by the throat. 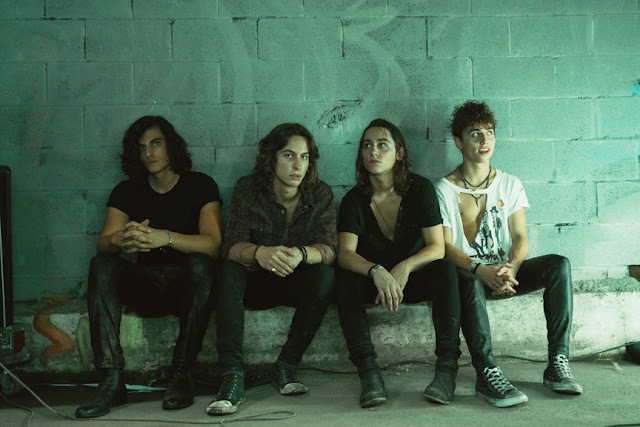 How is it a band can each stand on their own yet collectively bring it all together as a unit? Andy Gill: If you believe in what you are doing and you work at it, you can achieve great things. I asked McNiece to join the band 9 years ago because I knew he would be good and he wanted to do it. Likewise Gaoler. Song River: Everything Gang of Four does seem to come back to its own point... you create because of what you want... not what the establishment dictates. At the central point of of music, in general, how important is it to hold your own cards and deal not the hand you're given- but the hand you have chosen? Andy Gill: In life, you have to deal with the cards you are dealt, but within that hopefully you can make some strong and creative situations happen. Song River: Where to next? Andy Gill: I might be producing a re-working of the solo album I wrote with Michael Hutchence. I'm in conversation with various people about this including Danny Saber who co -produced with me the original album in the 90's. Producing and mixing the new live album: Live . . . in the Moment has been pretty time-consuming. I'm a really good record mixer but I am certainly not the fastest. So I have not spent as much time as I would have liked at working on new songs, so that's what I'm trying to do now. I have a few new ones in the bag and we will start to play them soon.